Why Does My Cat... Blink Slowly at Me? Has your cat ever looked at you, done a "slow blink" and looked away? Have you ever noticed how a cat will sometimes seem to look at you and then do a “slow blink” and then maybe even look away? You might wonder all sorts of things: Is my cat bored? Is she sleepy? Is she content? This “slow blink” behavior is very normal, though, and I can help you figure out what it means. In the animal world, direct eye contact or a hard or prolonged stare is usually perceived as a threat or challenge to the recipient of that stare. If two cats were to exhibit neutral or even friendly behavior toward each other, they would typically avoid making direct eye contact. That is because neither cat would want the other cat to interpret its look as a threat or challenge — which could provoke one of the cats to flee or for the interaction to escalate into aggressive behavior. So when cats look at each other, blink and look away, they are conveying the message that they are not “threatening” the other cat. 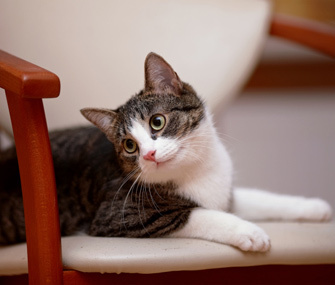 When a cat interacts with people and the cat is not threatened by the person, she may look at the person and then perform this same “slow blink.” She then may look away or she may not. If this happens, you can interpret this behavior as your cat not feeling threatened by or fearful of you. It may also be an indication that your cat may be receptive to more interactions with you. I always recommend to a person that they look for a blink from the cat and then slowly extend a finger out toward the cat and allow her to sniff. If the cat is receptive to more interactions with that person, she will sniff the finger and may try to rub her face on the finger or lower her head for attention. If the cat backs away or bats at the finger, it is a clear sign the kitty does not want any physical interactions with the person. The bottom line: While a slow blink does not always mean your cat wants physical contact with you, it is a way of signaling to you, to another person or to another cat that everything is A-OK and she is comfortable being around you! Can Your Depression Affect Your Pet? My Dog Just Bit Me — Now What Do I Do?